The 89-year old Belgian former Le Mans winner Paul Frère was involved in a car crash in Germany, close to the Nurburgring, last Wednesday and still is hospitalized in Frankfurt. His medical situation is getting better and if everything goes as planned, Paul will be transferred to a Belgian hospital in a fortnight. He raced eight times at Le Mans and won the race in 1960. He still is an important journalist and well known for his critical analyses, notably after each Le Mans 24 Hours. 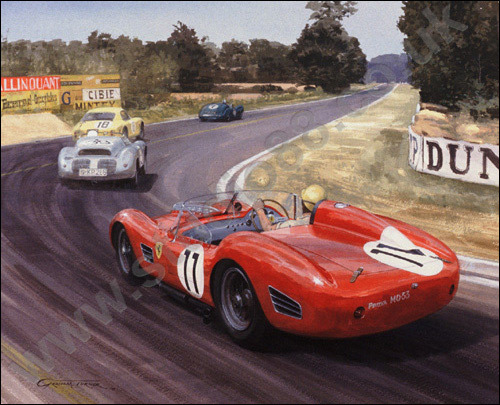 Below is a Graham Turner image of Paul Frère on the way to winning at Le Mans in 1960, with Olivier Gendebien. Our best wishes go to Paul Frère - and to Top Gear journalist Richard Hammond.